Dressed in an emerald green, floor-skimming satin dress with her hair swept back in a wet-look chignon, Haddas Ancliffe looks every inch the stylish wedding guest as she poses for a picture. But the blogger wasn’t the only one making an appearance in the snapshot, as the new mum was also joined by her 18-month-old son, who she was breastfeeding at the time. ‘Just me and my baby having a drink (Gotta do what you gotta do, wedding or not)’ the 21-year-old blogger, who goes by the name Dahsi, wrote captioning the Instagram shot with the hashtag #normalizingbreastfeeding. Since posting the candid snap has been liked 2,619 times and received over two hundred comments many praising the mum for highlighting the normality of breastfeeding. ‘It’s so nice to see you put your baby’s needs before your own,’ one follower wrote. Another felt even more aggrieved by the shot writing that the photo made them feel ‘ill’. Claiming she uses her blog as a platform for ‘self expression and open sharing’, this isn’t the first time Ancliffe has shared photos of herself breastfeeding her son Jonah in a bid to breakdown breastfeeding in public stigmas. ‘So this is my tummy nearly 11 months postpartum. It’s covered in stretch marks, has a little sag and is nowhere near as flat as it used to be. ‘Today I’m going back to the gym for the first time since having Jonah. There’s so much pressure in our society for mothers to “get their bodies back” and you feel a constant shame if you’re not working out to do that, but I can honestly say I am not ever going to try to get my body back. 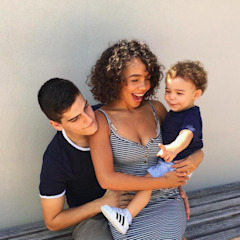 Seems like this blogger is tackling parenting taboos one Instagram post at a time.